Harambee stars recovered to beat Ethiopia 2-0 after having lost to Malawi by the same margin on Monday. Whereas Collins Okoth was the sole Kogalo player in action on Monday, There were no Gor Mahia or AFC players in action on Wednesday. Sceptics including former Gor Mahia and Harambee stars skipper Austin Oduor have suggested that the defensive pair of Mandela and Pascal are too slow and will be found wanting by a pacy forwardline. They have suggested the inclusion of Gor Mahia’s Eric Masika who is fleet of foot and can deal with speedy forwards. Most pundits said that Okoth was off colour in the Malawi game as was the rest of the midfield especially Titus Mulama and Jamaal Mohammed. In fact almost no Harambee stars player acquited himself well on Monday. Wednesday’s game was a vast improvement. Victor Ochieng was voted by most observers as the best Harambee stars player on show. However we all know Ethiopia is not as strong as Malawi so any celebration should not be excessive. Nevertheless, the win is worth some celebration because Ethiopia and Eritrea have humiliated Kenya in tyhe recent past at both club and national level. Remember AFC were unceremoniously dismissed by a nondescript Ethiopian club and last year, Harambee stars lost to Ethiopia at the same stage of this tournament. Coach Kimanzi kept faith with veteran keeper Duncan Ochieng who had a nightmare game on Monday. Sudan and Malawi tied in the other group C game. Kenya play Sudan next. Duncan Ochieng, Mulinge Munandi, Brian Mandela, Pascal Ochieng, Yusuf Juma, Humphrey Ochieng, Titus Mulama, Jamal Mohammed, Kevin Kimani, Victor Ochieng, Bob Mugalia. Subs: Jacktone Odhiambo, James Situma, Dennis Odhiambo, Jockins Atudo, Collins Okoth, Stephen Waruru, Paul Were, Stephen Ocholla, Eric Masika. IN the club’s elections held on Sunday, Ambrose Rachier was re-elected as Club Chairman. Rachier polled 1,299 votes against his opponents Collins Ajok and Emmanuel Achayo who got 988 at Nairobi City Stadium. Faiz Magak was elected first Vice Chairman. Anthony Ojee Odiyo and Sam Ominde retained the positions of second vice chairman and treasurer respectively. George Bwana was elected as secretary general. He polled 542 votes. Jolawi Obondo and Tom Oriku pollsed 452 votes and 436 votes respectively. Rachier was delighted in victory and urged the vanquished to join him in building the club. His two opponents Ajok and Achayo are relatively unknown. That they almost beat Rachier speaks volumes about the disillusion that many fans feel about the club. Truth be told, Rachier has done a lot for the club but there are many aspects of the club that leave a lot to be desired. Chief amongst those is the lack of financial transparency. There is also the flawed jersey deal with Legea and Tuzo. His lack of decisiveness and below par leadership when the club hit a rough patch did not endear him to fans either. Fans will be hoping that Rachier and his new team address these issues for the sake of the club. Anyone who wants to run for office in the future should borrow a leaf from George Bwana who did a lot of groundwork including raising funds for air tickets for the club. The bottomline is that showing commitment to the club goes a long way in helping you win office. Ajok and Achayo failed in this regard. Nobody really knows anything about them, Just as critical as doing groundork is to publish your manifesto explaining what your qualifications are and what your plans are for the club. This was generally missing from most candidates if not all. 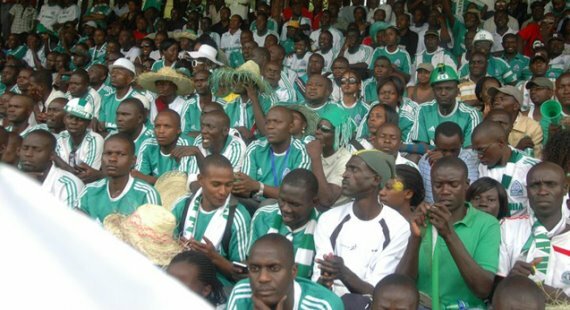 Finally this column urges fans to continue to support the club and explore ways to assist the club especially now that Kogalo is making a return to continental football. 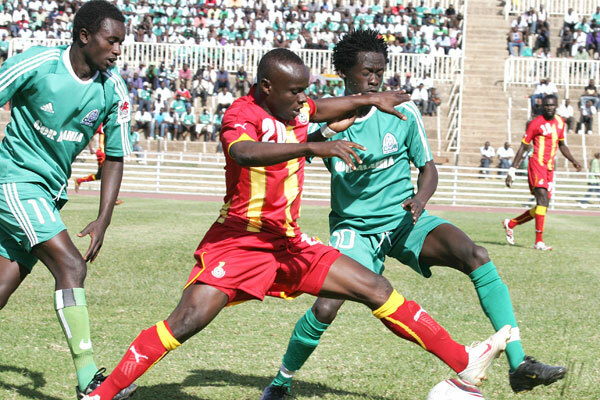 In the penultimate match of the 2011 season, Gor Mahia and Sofapaka played to a scoreless draw. The match was played at the Nyayo national stadium on Saturday. Gor Mahia were the better side. They came close on several occasions with Dan Makori, Demonde Selenge all coming close only to be foiled by Sofapaka custodian Duncan Ochieng. Finishing in front of goal is something Kogalo will need to work on. The draw means Gor Mahia finishes the league in 4th position with 48 points. One positive aspect is that they finished ahead of arch rivals AFC Leopards. Tusker coached by former Gor Mahia stopper and coach Sammy Omollo “Pamzo” have won the league. Congratulations to Pamzo. He has proven that he is a good coach when he is not under pressure. That means he is suitable for teams like Tusker that do not have a demanding fan base. 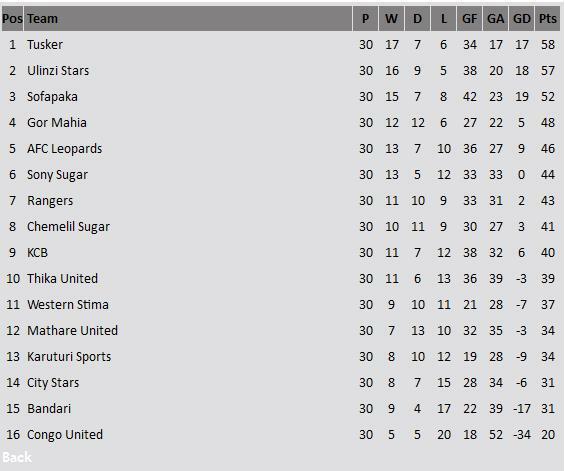 At the other end of the table, both relegated teams are from Mombasa. 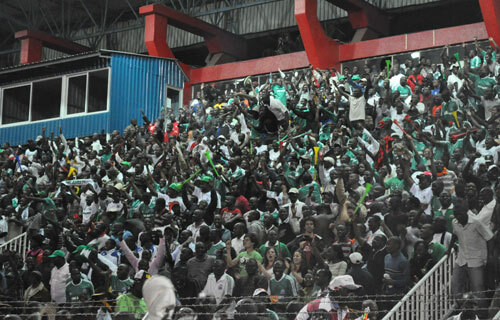 Which means no road trips for Kogalo fans to the coast in 2012. Gor Mahia will face Ghanaian traditional giants Asante Kotoko on Dec 8 in a friendly match. Kotoko will be in transit towards Tanzania where they will play a match to commemorate Tanzania’s Independence day. They will play a combined team comprising of players from Yanga and Simba. Kotoko’s glory years came in the late 1970s and early 1980s when they won the Ghanaian league several times in a row and won the Africa champions cup. When Ghana won the Africa nations cup, almost the entire team was composed of players from Asante Kotoko. That was the era of players like Mohammed Polo, Opoku Nti, Abdul Razak and legendary goalkeeper John Mensah, all of whom were the best African players are their respective positions. Earlier this year Gor Mahia beat the Ghanaian national team comprising of local players, leaving the Ghanaian coach to lament “I dont know how to explain to Ghanaians that their national team lost to a team playing in the Kenyan league”. Kogalo were in fine form on that day with new players like Ezekiel Odera making a mark. Unfortunately that was a false dawn for Kogalo. This match if it materializes will be good practice for Kogalo as they prepare to play in the Confederations cup next year. In fact Kogalo officials should strongly consider playing a few more friendlies against foreign competition preferably in a hostile environment. Gor Mahia settled the scores with Rangers FC on Thursday evening by beating them 3-1. The Kogalo 2011 season had started unceremoniously when they went down 3-0 to Rangers in the first league game. On Thursday evening however, Kogalo appeared determined to revenge. The first goal came in only two minutes via a stroke of luck. Anthony Akumu sent a pass to Dan Makori whose shot went into the net with the keeper expecting him to cross. John Kiplagat scored the second via one of his trademark “ballistic” missiles after receiving a pass from Musa Mohammed. And before Rangers could regroup, Anthony Akumu scored the third after 17 minutes following a goalmouth melee, Rangers pulled one back after 29 minutes. Gor Mahia continued to outplay Rangers in the early stages of the second half with Lavatsa missing a gilt edged chance or two. Gor Mahia are now in fourth place with 44 points. Scoring three goals will be a welcome change for the team that has been struggling to put the ball in the net. Kogalo now needs one of the strikers to step up as a dependable goal getter. Collins Okoth “Gattuso” was the only Kogalo player in action as Kenya tore apart Seychelles in a Pre-World cup qualifier played in Victoria Seychelles. The match may have well been a home match for Kenya as the stadium was filled with thousands of Kenyan currently resident in Seychelles. Erik Masika was the other Kogalo player called up. But he did not see action as coach Kimanzi preferred Mulinge Ndetto of Ulinzi as central defender. This was Kimanzi’s first game in charge after having replaced Zedekiah Otieno “Zico”. Should Kenya beat Seychelles, they will procede to the main world cup qualifiers in which their main opponents will be Nigeria and Malawi. This is a good chance for Kenya to qualify for the world cup as Nigeria does not seem to be particularly strong nowadays. They recently failed to qualify for the Africa cup of nations and none of their players were selected in the Africa XI for the year 2011. A starke contrast to previous years. The fact that Mikel Obi the sideways passer is the most reknown Naija player today speaks volumes about their drop in talent. On another note, speedstar Edwin Lavatsa has been called up to the national team to beef up the squad that will start training for the CECAFA cup that is due later this month. Lavatsa has previously played for the U23 team whose campaign ended in disaster loosing 5-1 to Uganda. Kenya fans will hope that he will be showing opposing defenders in the CECAFA cup a clean pair of heals as he does in the Kenya Premier League. Gor Mahia elections guidelines are finally out, with the elections expected to be held on November 27th at City Stadium. Nominations papers will be available at the Gor Mahia offices at Nyayo Stadium block A with the deadline for returning the papers set for 14th Novemeber by 5pm. Candidates will have to pay ksh 10 000 for nominations to the various elective posts available. The vacant posts will include Chairman,Snr vice chairman,2nd vice chairman,secretary general,assistant secretary general,treasurer,organising secretary and assistant organising secretary. Branches have been called upon to submit their lists of registered members to the secretariat by Nov 21st with mandatory identification numbers. The elections will not be done by the secret ballot but delegates will que in line to vote for the prefered candidates. All members will have to pay a ksh 100 to be allowed into the venue of the elections at City Stadium. Sacked Harambee Stars coach Zedekiah “Zico” Otieno has resumed training with his Kenya club Gor Mahia. He has promised to turn around the teams fortunes by winning the clubs two remaining matches in the Kenya Premier League against both Rangers FC and Sofapaka. Zico presence in the team is expected to spark more protest after he was hounded out of the team last month by fans who demanded his replacement after the team posted poor results. During his last match against Congo United last month, he had to run for his dear life after aggrieved fans pelted him with stones and bottles on his way to the dressing room after the match. The club later paid heavily after the Kenya Premier League (KPL) disciplinary body fined the club heavily before slapping a one match ban to play in an empty stadium. Club assistant secretary Ronald Ngala told Star Africa that he was not aware of Zico’s presence in the team. ’It seem’s you reporters are well informed than me. I didn’t know Zico has resumed training but if that is true, we do welcome him back. What I know is that he had asked for leave which we granted” said Ngala. Zico who has been doubling up as Harambee Stars coach until last week when he was relieved of his duties said he was focusing on the two remaining matches. He spoke at the Nairobi City Stadium after conducting the afternoon training session, Zico disclosed that contrary to what people were saying, he was not sacked in the National team since he was contracted by Harambee Stars Management Board (HSMB) to handle the team on a temporary basis until they get another coach. ‘Whoever is saying I was sacked got it wrong. I was contracted to steer the team on a temporary basis until when the board was able to hire another coach. There was no written agreement or contract to that matter. I was just told to step aside since they got another coach which to me is in order” said Zico. He observed that he will now get adequate time to concentrate with his club where his main target is to collect six maximum points in their two remaining matches. Newly elected Football Kenya Association (FKA) have protested over the appointment of Gor Mahia chairman Ambrose Rachier as one of the two Kenyan Premier League (KPL) representatives in the National Executive Committee (NEC). Rachier was appointed by the KPL alongside KCB chairman George Odhiambo but his appointment was rejected by FKA National Executive Committee. He also said the move amounts to conflict of interest as Rachier was a candidate for the position of chairman in the October 29 polls. “This move if left to stand, will start causing acrimony after we have had a very good start with KPL,” said Nyamweya, adding that Odhiambo’s nomination was undisputed. Rachier’s appointment was also contested by AFC Leopards chairman Alex Ole Magelo who said the due process was not followed. Elsewhere, coast fans sighed with relief after relegation-threatened Bandari beat hosts Karuturi FC 1-0 to revive their survival hopes. Bandari is the only team still carry coast hopes after their neighbours Congo United were shown the door after succumbing to 0-4 to against AFC Leopards in Mumias. Newly elected FKA Mombasa sub-branch chairman Ali Hussein hailed Bandari feat away at Karuturi. “Their victory is the victory for all the coastal soccer fans as they are apparently the only hope for the region in Kenya Premier League (KPL),” said Hussein.